Through our services, we support and focus on the needs of our clients to develop ways that ultimately deliver a strategic roadmap to serve as the foundation of their businesses growth and development. 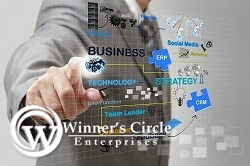 Winner’s Circle Enterprises was born out of a need for ways to create more market share. As a company with years of experience in creating and supporting other businesses, the Winner’s Circle has worked with hundreds of business owners across the country. During this time, CEO and Founder, Ralph Sampson recognized the need to develop strategic and global strategies for businesses to compete in a global economy. As a retired professional athlete with over fifteen years in the business world, along with a team of experienced professionals, we take pride in developing winning ideas and strategies that leave lasting footprints for our clients continued success. Spending years in marketing supporting our clients, we have developed a game plan for the Winner’s Circle and are now leading the way with innovative and fresh ideas to sustain the successful development of companies across the country. Collaborated by a team of experienced professionals in marketing, technology and business strategy. we are WINNER’S CIRCLE ENTERPRISES.